Mark your calendars — the 4th Annual Duck Derby is back for another day of fundraising fun! Hosted at the Nashville Shores, the proceeds from this event will be used to help place more Chemo Ducks into the hands of young cancer patients in need. A prize of $1,000 will be awarded to the donor whose rubber duck is the first to cross the finish line. Additionally, 24 Chemo Ducks will be donated to the hospital of the Duck Derby winner’s choice. Along with the main Duck Derby event, there will also be family-friendly games and activities throughout the day, including a scavenger hunt and duck face contest. Door prizes will also be available. 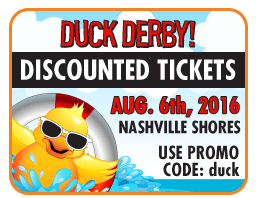 Duck race at 3 p.m.
Discount tickets are available starting June 29 from nashvilleshores.com – visit main website, in main search bar on home page, type in promo code: duck. For every ticket sold, $3 will go back to Gabe’s Chemo Duck Program. For only $5 you can purchase a duck and enter the derby for your chance to win a prize of $1,000. This year we are encouraging folks to create a Duck Derby team! The more ducks, the greater your chance at winning the grand prize…$1,000! This is a great opportunity for groups and businesses. Set up your team today.